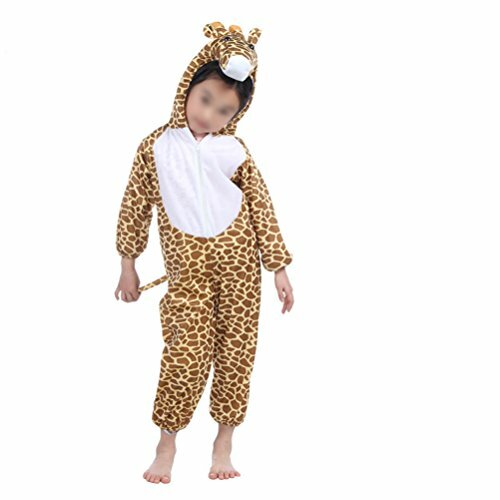 Whether you're looking for a Halloween costume, tiny cosplay team member, or Christmas present, this animal costumes will make the ideal gift for your children. This costume outfit can not only make your sweetheart special and remarkable, but also able to let them feel good and comfortable with its premum texture. She or he will have so much fun. Perfect for cosplay, Halloween, stage performance and any other scene dressing. - Size S fit for children of height of 75-90cm. - Size M fit for children of height of 90-105cm. - Size L fit for children of height of 105-120cm. - Size XL fit for children of height of 120-140cm. - Soft texture for comfortable wearing. Easy to put on and take off. Convenient to clean and store. - Loose fitting materials allow you the flexibility of movement while maintaining style and comfort. - Can also keep your little one warm during those cold winter months. - Adorable giraffe design with matchable color. Make your dressing up more fun and creative. Soft texture for comfortable wearing. Easy to put on and take off. Convenient to clean and store. Can also keep your little one warm during those cold winter months. Adorable giraffe design with matchable color. Make your dressing up more fun and creative.